A quick glance at the picture above and one will think that it’s a lake in a Canadian national park or a valley scene in the Swiss Alps. It’s an alpine scene alright – in the Swat Valley of northern Pakistan. Perhaps landscapes like this have led Lonely Planet to dub Pakistan as “on the brink of being tourism's ‘next big thing’ for more years than we care to remember.” Intrusions by militants to this valley and other parts of the northwest frontier prior to 2009 only exacerbated the situation. 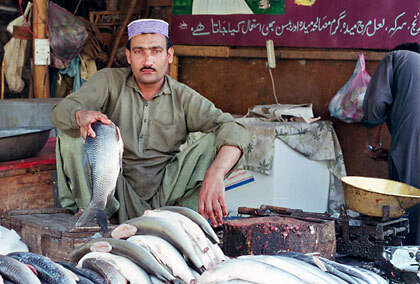 A Pashtun man selling fish at a souk or market in Peshawar. Security problems notwithstanding, Pakistan’s tourism potential remains huge due to its varied landscape, diverse cultures, and numerous historical sites. We traveled to this country several times as part of our former work and got to appreciate Pakistan and its people over the years. As part of the Indian subcontinent Pakistan has many cultural similarities to India. There are several ethnic groups (and languages) with Punjabis making up almost half the population while Sindhis, Pashtuns and Balochs make up the rest among others. The Pashtuns here are related to those in Afghanistan. Indeed many parts of Pakistan where these people reside used to be part of Afghanistan until the British came in the 19th century and altered the political landscape of the region. Pakistanis in traditional salwar kameez garb at a market in Karachi. Pakistanis are a hospitable people and the Pashtuns have been called as one of the most hospitable people on the planet. We’ve experienced this brand of hospitality on numerous occasions. On a trip to Jhelum, Leo stopped for a snack at a local store and was treated to a free meal by the curious storeowner who said he was the first Filipino he had ever seen. We’ve also been invited to home meals on several occasions. Probably the most unforgettable was Leo’s experience in seating down for a meal with town elders in Mardan in the former Northwest Frontier Province (now the Khyber Pakhtunkhwa) and dipping naan bread in a communal pot of curry while squatting on the ground. 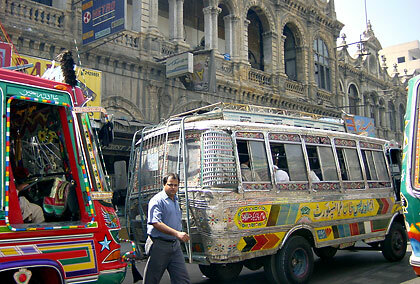 Colorful mini-buses on a crowded road in Karachi. These kind of vehicles are very common in south Asia. Pakistani (and Indian) dishes are among our favorites. Pakistani cuisine, especially in the Sindh and Punjabi regions, has a marked similarity to north Indian cuisine while that of the Khyber Pakhtunkhwa has strong resemblance to Afghan cuisine. Pakistani cuisine has also been influenced by Chinese cooking in recent years resulting in a rich blend of the two. While we found it easy, even enjoyable, to adjust to Pakistani cuisine we had more difficulty adjusting to the meal times. Breakfast usually took place at 9AM and sometimes as late as 10. Lunch was usually taken at 3PM and dinner at 9PM or even at 10PM. 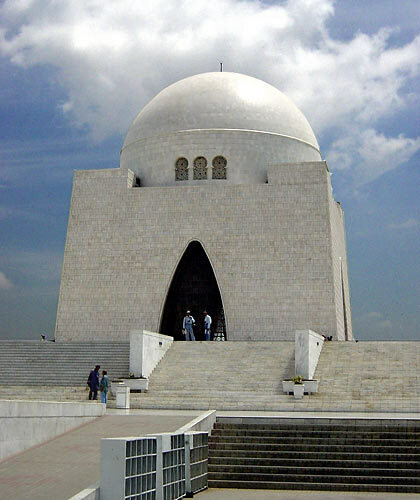 The mausoleum of Muhammad Ali Jinnah, the father of Pakistan, in Karachi. Most of our travels to Pakistan were to its major cities. Karachi is the largest, most populous city in the country and Pakistan’s economic and financial center. We ended up spending majority of our time in this city, the former capital of Pakistan. Lahore in the Punjab is the cultural and artistic center of the country and its second largest city. Lahore is characterized by several architectural landmarks dating back to the era of the Mughal emperors of India and the British Raj. Islamabad and Rawalpindi are the so-called twin cities of Pakistan, being located adjacent to one another. They are not identical twins, however. 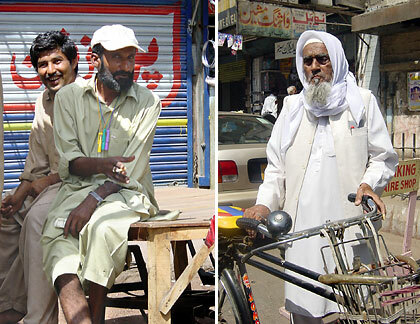 Rawalpindi is an old, crowded, typical South Asian metropolis. Islamabad, on the other hand, came into being only in the 1950s and is a smaller, well-planned city with wide avenues, modern architecture and green parks. It is also Pakistan’s capital, a city unlike any other in the country. 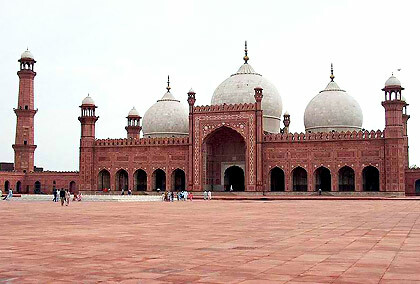 Lahore’s Badshahi Mosque, built by the Mughal Emperor, Aurangzeb. Aurangzeb’s father was the emperor Shah Jahan, builder of the Taj Mahal. Notice the similarities between the two structures. Photo courtesy of Wikimedia Commons. These cities are mostly located in the Indus River plain with some of them located near desert areas. Consequently it can get really hot in the summer but also cold during the winter months. There is a proliferation of historical sites dating back to ancient times in these areas. Mohenjo-daro, Harappa and Taxila are prime examples. Mohenjo-daro is one of the largest settlements of the ancient Indus Valley Civilization, and one of the world's earliest major urban settlements while Taxila was declared a UNESCO World Heritage site because of numerous Buddhist ruins dating back to the Gandhara period. There aren’t too many natural attractions in these parts however. If you’re searching for beautiful landscapes then head to northern Pakistan. 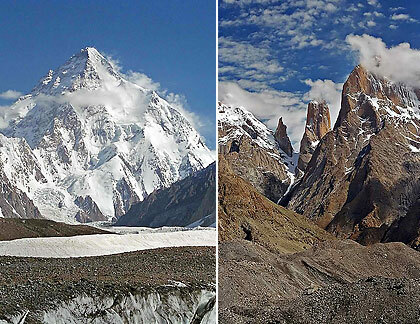 Rugged, statuesque beauties of the north: K2 (left) is the world’s second highest peak after Mt. Everest; the Trango Towers (right). Photos courtesy of Wikimedia Commons. A destination for half of the tourists visiting Pakistan, the northern part of the country contains an abundance of tourist destinations, many of them still unexplored. The Gilgit-Baltitstan area is home to the Karakoram Mountains and the Hindu Kush including some of the world’s tallest peaks such as K2 (the second highest mountain in the world) and Nanga Parbat. The Baltoro Glaciers and two others in Gilgit-Baltistan are among the world’s longest outside the polar regions. The Chitral Valley is home to the pagan Kalash tribe (said to be descendants of Greeks exiled here by the Persians before Alexander the Great’s time) and contains stunning scenery. And it’s not just nature that may be admired here. The Chitral and nearby Hunza Valley also contain several historical fortresses and towers. Panoramic view of Kundol Lake in Swat Valley. Photo courtesy of Wikimedia Commons. 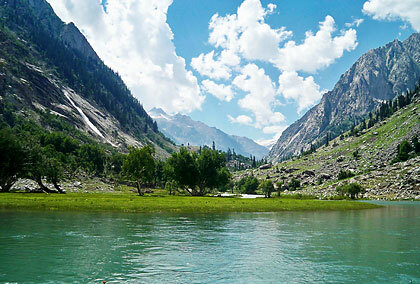 And then there’s the Swat Valley, a region of dramatic landscapes dubbed the “Switzerland of the east” for good reason. Snow-capped peaks, lush green landscapes, rich farmlands and rivers stocked thickly with trout are just some of the sights to behold here. There are also many historical ruins dating back to the Gandhara period. Unfortunately sectarian and political violence in or before 2009 has done much to damage tourism in the region although strenuous efforts were made to get the tourists back after the government swept the area clean of militants that same year. The Khyber Pakhtunkhwa and autonomous tribal areas along the border with Afghanistan continue to be a tinderbox. Leo had spent some time traveling to some of these areas from the ancient city of Peshawar, capital of Khyber Pakhtunkhwa (formerly the Northwest Frontier Province). The city itself is a maze of ancient bazaars, darting autorickshaws, high-walled homes and British military cantonments. From Peshawar Leo was able to travel through the Khyber Pass all the way to the border with Afghanistan when most of that country was still under Taliban rule. Even during that time, Kalashnikov-toting tribesmen he met along the way did not exactly inspire feelings of security. 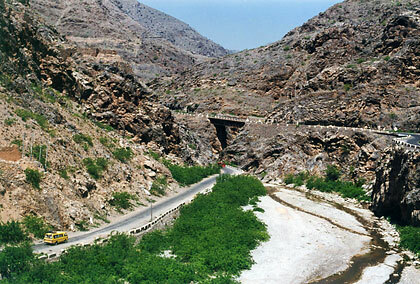 The Khyber Pass leading to Afghanistan. Armies have trodden this very road since ancient times. It’s unfortunate to see Pakistan getting listed as one of the most dangerous countries in the world by The Economist. Outsiders often tend to exaggerate the dangers in almost any situation but the security situation in northern and western Baluchistan, the Khyber Pakhtunkhwa, the Federally-Administered Tribal Areas and Agencies (FATA) including Waziristan, and border areas other than official crossings is indeed uncertain, hence the continuing travel alert for these areas. It’s such a pity because these are among the few places on earth where one gets a good mix of historical sites and natural attractions. A trip to the beautiful areas of the north remains a dream for us and for many other travelers. We can only hope the situation in these places get better not just for the sake of tourism but more so for the welfare of the local populace who have suffered the most from conflict in these parts.